Real Day After Wedding Photo Shoot | Happy Halloween! In light of Halloween, we just had to share this chilling day after wedding photo shoot, taken place at the Sterling Opera House in Derby, CT shot by the amazing Maler Photography. This is such beautiful shoot. I love the deep purples and ivories the couple chose, the complement the style of the venue so well, well maintaining a very classic and elegant look. Photographers Michael & Marcie say that they "will never forget the feeling we had walking into the Sterling Opera House...the air was cold, crisp..." Being around 122 years old, most who have stepped foot into the old opera house, say that they have seen and experienced things they can't quite explain!! What do you think? Do you believe in ghosts?! If you are doubting, be sure to check out the video of the shoot below...but don't get too scared ;) Happy Halloween! The next wedding season hints at the idea of doing away with traditional white wedding dresses. All over the runway designers were showing dresses in colors like black and taupe, nudes and champagnes, and mauves and purples. What do you think? Will you be daring enough to go against the traditional way? In continuation of bringing you today's trends from the runway, we are sharing with you the peek-a-boo wedding dress. We saw a lot of this during the shows. We have picked a few of our favorite "peeking" dresses, showing off the style by either a slit allowing your legs to peek through, or having underlying layers of tulle or organza shine through from underneath! Either way these dresses are super chic and classic. What do you think? Is your wedding dress style a "peek-a-boo"? Hi all! Lela's pick today from the runway is floral inspired wedding dresses. Whether it is floral embroidery and beading, hand-sewn silk flower embellishements, or layers upon layers of tulle and organza, flowers are definitely the inspiration for the 2012 wedding season. This trend has been found all over the runway including top designers like Badgley Mischka, Romona Keveza, Monique Lhuillier and Oscar de la Renta. What do you think? Are you loving this floral frenzied fashion? As promised, we are going to be sharing with you Lela New York's top picks in wedding dresses by the different styles as seen on the runway. Today we will start with ball gowns! Overflowing with soft layers of tulle and organza, these gorgeous dresses are so classic and feminine. I absolutely love the Jenny Packham dress, it is the perfect balance providing a fitted bodice with a beautiful fuller skirt, and check out the gold crystals..so pretty! What style wedding dress best fits you? Are you a ball gown beauty? Next week we get to share all the trends and bridal fashion galore that we saw during the shows! Tons of eye candy, we promise. This years Bridal Market was full of fun, great fashion and I got to see friends I haven't seen in a long time including twitter friends, fellow bloggers and event pros alike. Stay tuned for next week for even more wedding dress trends. First off, Martha! Martha Stewart Weddings knows how to throw an event and I was so luck to be there along with the who's who of the wedding industry. The 2011 bridal market celebration was filled with tons of entertainment for the senses including amazing music by Élan Artist, manicures by Essie, ice cream by eCreamery, eyelashes by Paul Labrecque, custom scents by Wedding Library and Callahan catering who provided the most delightful mini finger foods I have seen! Check out the mini coke bottles and mini beer bottles. They also had the always fun Photobooth by The booth as well as custom photo flipbooks by picFlips, SO fun! Martha Stewart Weddings Bridal Market Celebration 2011. Thank You to Courtney Kern for some of the images above. Tomorrow I'll share more fun party picts for part 2! And next week, we will be sharing our favorite picks from bridal markets 2012 shows. And don't worry we broke it down for you into trends so you can get the most out of your bridal market experience :) and choose your perfect wedding dress! Here at Lela New York, we just finished up with New York Bridal Week, where we were able to see many beautiful new bridal fashion trends for the 2012 wedding season. One trend that stuck out the most and what we predict will be the new popular wedding sihouette that will outshine the mermaid is the dropped waist. Combining a figure flattering fit with a fuller skirt, the bride can get the best of both worlds! Below are just a few dresses the show the dropped waist by designers like Ines Di Santo, Kenneth Pool and Maggie Sottero. What do you think? Will the 2012 wedding season be the a year of the dropped waist? Newlyweds, Lynn and Mike tied the knot this past September here in NYC. 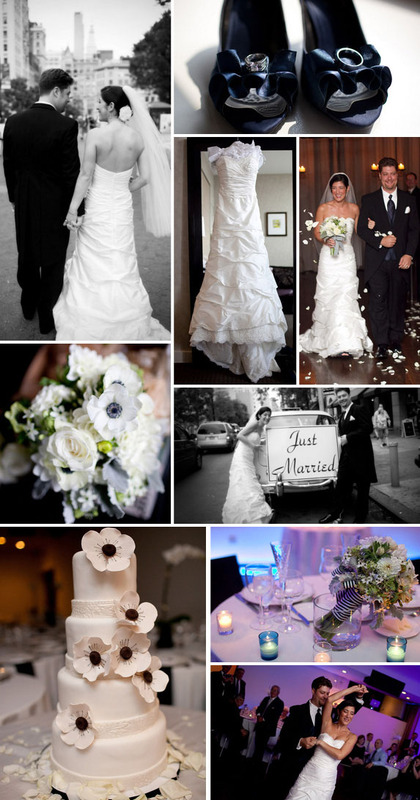 I love splashes of blues added to the couples classic black & white color scheme. I also love their wedding cake! Doesn't it look delicious?! I love that the flowers match the ones in the brides bouquet...super cute! Thanks to NY photographer Casey Fatchett for such great shots! Hello all! 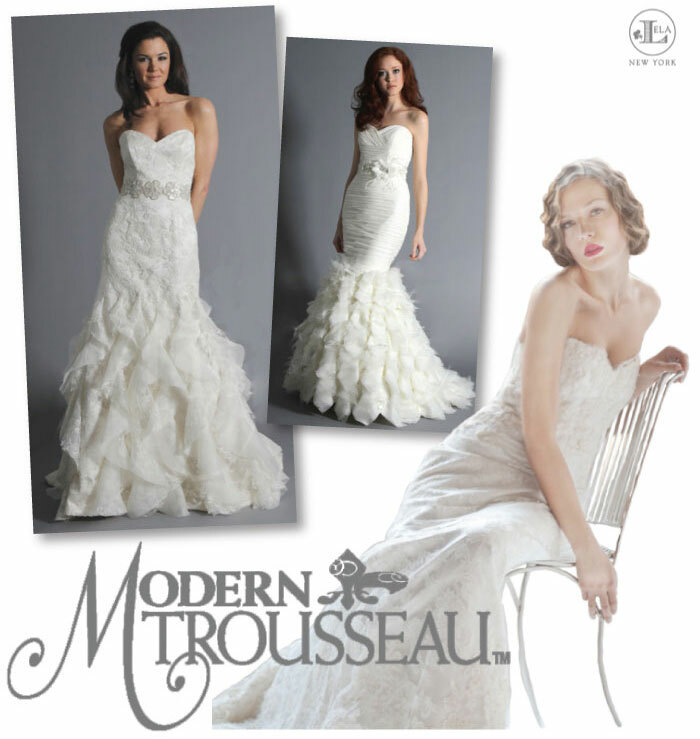 In the upcoming weeks we will be sharing wonderful bridal fashion brought to you by New York's Bridal Market. 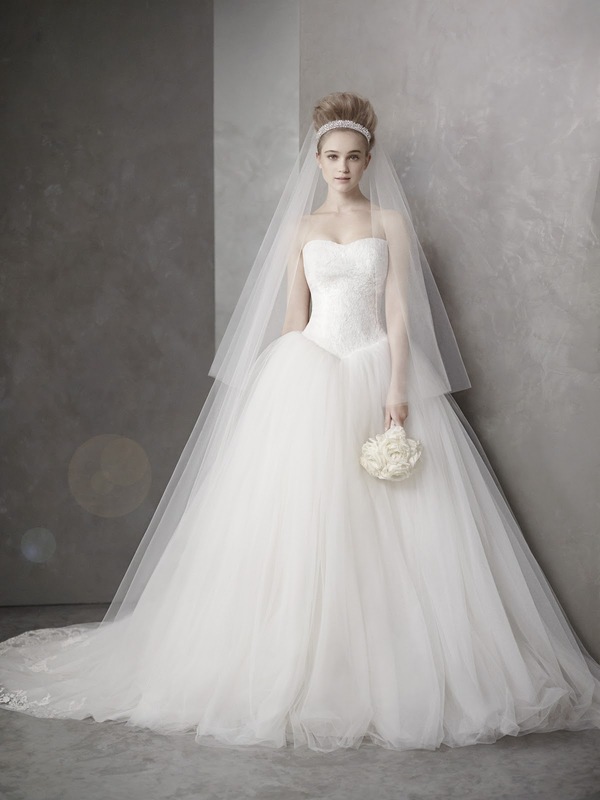 To start, we are sharing a sneak peek of Spring 2012 White by Vera Wang bridal collection! As usual, they are all SO beautiful and with prices starting as low as $500 to $ 1500, you can now get your own Vera Wang dress too! Why not?! Also, be sure to check out the dress inspired by Kim Kardashian's wedding dress, one of the highlights of the new collection. Enjoy! See the beautiful and chic bridal collection! Every bride wants to look their most beautiful on their wedding day...but how can you guarantee your makeup will stay looking as fresh as when you first put it on?! We have provided for you some of Lela's top "waterproof wonders" that will be sure to endure the festivities of your special day, without leaving you looking like a raccoon! Make sure to test out your makeup several days in advance to see which colors work best for you and remember less is more, you still want to feel comfortable in your own skin! It is your day to look beautiful, soft and glamourous!